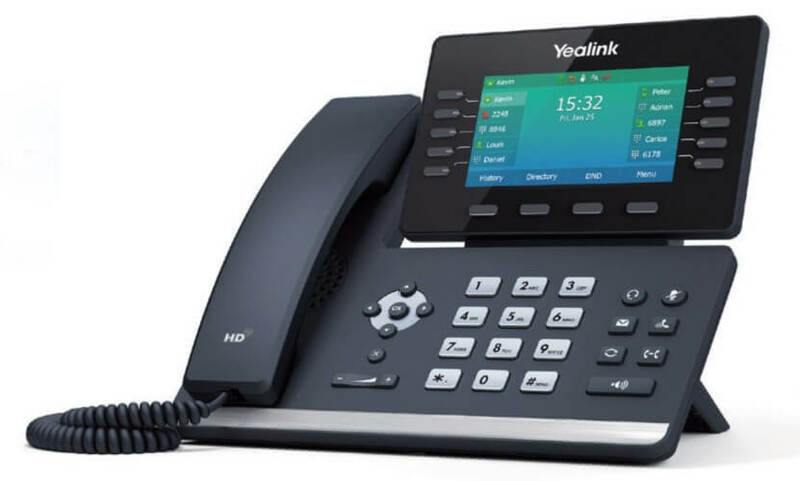 Yealink SIP-T54W IP Phone features an adjustable 4.3-inch color LCD screen that you can readily adjust it to the comfortable viewing angle according to yourself. As to the audio quality, the SIP-T54W is coupled with the latest version of Yealink Optimal HD Voice technologies, including Yealink Acoustic Shield technology, that effectively eliminate background distractions and noises, deliver crystal clear voice even in a noisy environment. Meanwhile, complying with the latest Hearing Aid Compatibility (HAC) Regulations, its HAC handset helps the person who is with hearing loss to hear the voice more clearly. Yealink SIP-T54W IP Phone not only furnish you with the built-in Bluetooth 4.2 for Bluetooth headsets and mobile contacts synchronization, but also the built-in dual band Wi-Fi for Wi-Fi connectivity, allowing you to access the 5G Wi-Fi connectivity handily. Also if you want to expand your horizons for busy environments, or, share one phone system with your small team by adding multiple handsets, just simply turn your IP phone to the corded-cordless phone via DECT technology. Moreover, the IP phone can function with Yealink VC Desktop together to share content from your laptop, making collaboration much easier than before(1). A built-in USB 2.0 port allows you to enjoy USB call recording via USB flash drive. Via this USB port, you also can connect wired/wireless USB headset without connecting Yealink EHS36 anymore, and connect up to 3 Yealink expansion modules EXP50 which can be programmed with up to 180 paperless DSS keys. The Yealink SIP-T54W supports efficient provisioning and effortless mass deployment with Yealink’s Redirection and Provisioning Service (RPS) and Boot mechanism to help you realize the Zero Touch Provisioning without any complex manual settings.